Home to over 5,000 islands, the Caribbean offers a combination of sunny beaches and wonderful local culture to suit any traveller’s tastes. From Aruba to Barbados, the islands of the Caribbean vary dramatically in terms of culture, but share much the same climate throughout the year. There are some small variations in local temperatures – when it’s 70-something in the northern islands, it may be 80-something in the southern ones – but most of the time, a warm and sunny day in Barbados is a warm and sunny day elsewhere. Because of this, it’s fairly easy to work out the best time to travel to the Caribbean, regardless of the particular island you’re visiting. Read on to learn from the experts at Royalwestmoreland about the best time to visit the Caribbean. While the idea of going to the beach in winter might scare people from temperate climates, the ‘winter’ of the Caribbean has little in common with the winter we’re used to back at home. The Caribbean winter lasts from December until early April. During this season, rainfall is rare and sunny weather is the norm. Although it’s winter, the daytime temperature varies from 60-90 degrees Fahrenheit in most destinations. Because of the cool weather in North America and Europe during this time of year, the Caribbean fills up with tourists from December until late March. Book ahead of time if you plan on visiting the islands during this time of year. Like all tropical regions, the Caribbean experiences powerful rainstorms for three months every year. Unlike the Pacific Islands or Southeast Asia, however, the wet season of the Caribbean is far windier than it is rainy. Known to locals as the ‘Hurricane Season,’ the period lasting from September until the end of October is when most Caribbean hurricanes occur. It’s important to note that hurricanes do not affect all islands, and that travel in the region is still possible during this time of year. From May until August, the Caribbean is warm, immensely humid, and delightful to visit as a traveller. As the flood of tourists return home, the resorts that come at an incredible cost during peak season lower their rates and open their doors. Likewise, the beaches that were once crowded from morning until night become an open expanse of sand just waiting for you to visit. If you’re searching for untouched nature and great prices, the Caribbean shoulder season is a great place to look. Whether you are alone or in the company of other people, travelling around the world can be a great experience that you will live to remember. In fact, there are several beautiful places around the world that you can visit like the valleys in Pakistan; Antelope Canyon in USA, Phi Phi Islands in Thailand, Santorini in Greece, Killarney in Ireland, Great Barrier Reef in Australia among others. However, finance is always a bigger challenge. Below are some of the most important financial tips that you should always consider before you embark on travelling around the world. A budget is a detailed plan of activities and places that you are planning to visit on your trip. It is always advisable that before you travel around the world, you need to come up with a list of the places that you wish to visit, the activities that you would like to indulge in, and also the amount of money that all the activities will cost. When making the budget, you have to look into your interests and also your financial status. When preparing the budget, it is advisable that you only include what is necessary in order to avoid making the trip so expensive. In order to ensure that your travel around the world is exciting and without inconveniences, it is always advisable that you begin saving early. By starting to save early, you can be able to meet the financial requirements for your trip when the scheduled time for it comes. There are various kinds of saving plans that you can choose from whenever you are planning to travel around the world. In case you are from the UK, ISA is one of the best saving plans that you can use in order to make some money for travelling around the world. However, you should first get answer to the question, ‘is your cash ISA flexible?’ It would be ideal to start saving through this plan in case your ISA cash is not very tight. Traveling around the world comes with various kinds of challenges especially when it comes to the distance of travelling. For instance, connecting flights from various places like the valleys in Pakistan to the Great Barrier Reef in Australia can be very expensive. It is therefore important that you do advance booking for transport, accommodation among other services that you will need. Early booking can help you in saving a lot on finances since you are likely to get discounts. There are several ways through which you are able to save on finances whenever you are travelling around the world. By doing some little research online, you are able to get useful tips on how to save on expenses while on the trip. Response to emergencies can be quite expensive especially when you are out of your country. By signing up for Smart Traveler Enrollment Program (US residents only), you are able to avoid paying for emergency response since that will be taken care of by the state. Tenerife – Tacky Or Cultural? Tenerife, the most populated – and popular – of the Canary Islands has an almost perfect year round climate. With winter temperatures of 20-22 degrees and summer temperatures in the mid or high twenties, this climate has earned Tenerife the title “Island of Eternal Spring” and has helped make it a favourite tourist destination with over 5 million visitors each year. Because of its great natural beauty and dependably fantastic climate, Tenerife has long been a popular holiday spot and has attracted its fair share of package holidays. These cheap and cheerful holidays have, however, in some circles, given Tenerife an undeserved reputation of being just a sunny, resort full of lager louts and hen parties. The truth about Tenerife is that it also boasts a number of attractions – natural and cultural – that can offer much to the discerning traveller. There are many outstanding places of beauty and history on this sunny island but perhaps the most spectacular of them all is its famous national park – Parque National de las Canadas del Teides. This park, which has been designated as a National Park since 1954, was declared a UNESCO World Heritage Site in 2007. The Teide National Park features a volcanic crater which is 48kms in circumference. Out of this crater El Teide, the highest peak in all of Spain, rises 3,718 metres – 2,000 metres above sea level. This spectacular mountain, generally covered in snow in the winter, can be seen rising majestically above the sunny lowland beaches. 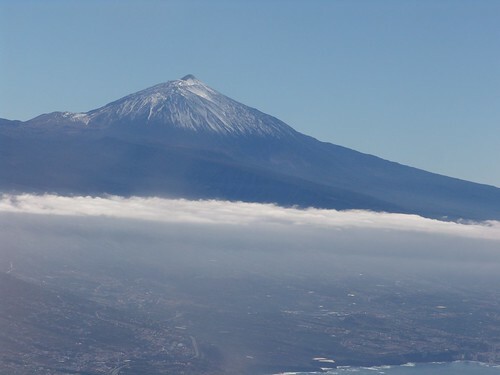 The most visited place on the island, it is possible to even go to the summit of Mount Teide. However, most visitors content themselves with simply travelling part of the way, enjoying the contrast as they climb from the sunny, southern coast, up past villages which are reminiscent of Alpine village and then, even higher to the stark, lunar landscape of Mount Teide. The flora and fauna in the National Park are specific to the altitude and landscape and much studied by scientists from around the world. Another Tenerife speciality is an event rather than a place. This is the Carnival of Santa Cruz de Tenerife. Held in February each year, this carnival is considered second only to the Mardi Gras Carnival in Rio de Janeiro. The Carnival of Santa Cruz de Tenerife has applied to be considered a UNESCO World Heritage site. The festival begins with a parade on the Friday before Ash Wednesday each year. Thousands of people in fancy dress party that night – and every night until Ash Wednesday. On Ash Wednesday, the people of Santa Cruz celebrate the ‘entierro de la sardina’ (the burial of the sardine) and this event officially ends the Carnival – though not the festivities which continue throughout Lent. Budget flights to Tenerife are readily available from almost anywhere in Europe. Because it is such a universally popular holiday destination, both national carriers and all the budget airlines fly to this island. There are two international airports on the island of Tenerife, making it easily accesible from just about anywhere in the world. Of these, Tenerife South-Reina Sofia Airport – in the south of the island – is the most popular. Tenerife North Airport, is the other major airport. This airport, is close to the town of San Cristobal de la Laguna and just 11 kilometres from the capital Santa Cruz.